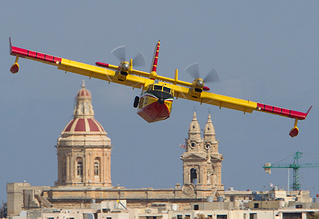 Run by the Malta Aviation Society, Malta International Airport and the Armed Forces of Malta, this event has continued to evolve through the years and has become a highly entertaining programme of aerial events. This year the event changed shape again due to the current on-going expansion of the airport, but being staged at the International Airport means that there is routine traffic with priority throughout the airshow. This routine traffic brings hoards of tourists to this sunshine islands from three continents (Africa, Asia and Europe), but Malta is unique in having the capability to stage an airshow at such a busy airport. Squadron Prints' Gill Howie reviews the action for UK Airshow Review and Berry Vissers provides additional photos. A Luftwaffe Tornado was the first international arrival at this, the 18th airshow to be staged here, with a callsign of "GAF L04", he touched down on Friday morning and the airshow build up had begun. A succession of aircraft arrived throughout the day with the US Navy supplying a C-20, two C-26s from Sigonella and on the Sunday only, a P-3C Orion from VP-16. The USAF supplied a C-21 from Ramstein and a KC-135 from Mildenhall. 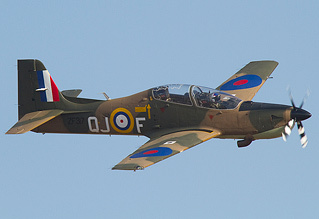 The RAF supplied three Tucanos - one black aircraft for static display and the two specially marked Battle of Britain examples for the flying display. Also in the flying display was Flt Lt Scott Griffiths showing off the specially marked Hawk Display aircraft in the role demo, supported by an all black Hawk from 208(R) Squadron, both aircraft, of course, based at RAF Valley. More RAF aircraft arrived including a Dominie from 55(R) Squadron based at RAF Cranwell in Lincolnshire and three 41(R) Squadron aircraft from RAF Coningsby - two Harrier GR9s and a single Tornado GR4. 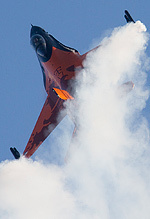 The Royal Netherlands Air Force was there with a massive KDC-10 on static which, in turn allowed two Dutch F-16s and two Belgian F-16s take part. They were refuelled on the way to Malta and on the way home! What a massive aircraft to have on static and certainly attracted the attention of the crowd. 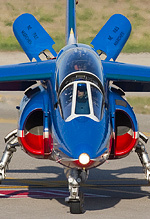 The Patrouille de France participated, and the team was supported by two C-160 Transalls, one of which remained on static display for the show. Closing the show both days, the French aerobatic team was a massive crowd pleaser, and the audible "ooohs and aaaaahs" from the crowd were a joy to hear. I am sure the French Ambassador and his wife, and the Air Force General who were all present were filled with immense pride when the crowd erupted in applause when the heart-shaped smoke trails appeared in the sky. 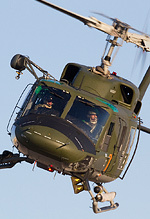 The Armed Forces of Malta had an Alouette III, Bulldog and Islander on display along with the AB212 from the locally-based Italian Air Force's Mission which, on both days, showed off its capabilities by performing a search and rescue winching demonstration. The Maltese Alouette IIIs then displayed their skills firstly with a green and white version example, then, as if by magic, it disappeared and re-appeared wearing a new grey camouflage scheme - a clever trick. All was revealed when the green and white Alouette reappeared and they flew together in an entertaining pairs routine. 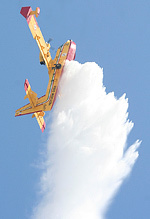 There were two eagerly awaited displays at this show, the first of which was Malta Airshow regular, the Canadair CL-415 Water Bomber from the Italian Protezione Civile. Its dramatic manoeuvreability is a sight to behold for an aircraft of this size. It performed a water drop, then disappeared to scoop up some more of the Mediterranean Sea and further deposit gallons of water over the 05/23 display line - twice each day he 'water dropped' on the airfield to the delight of the crowd. As he climbed almost vertically, this stunning display is, perhaps, what Malta Airshow has become most famous for. 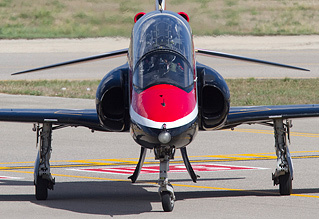 The second of these eagerly awaited aircraft made its airshow debut at Malta. Restricted to taxiing past the crowd on the Saturday due to the increasing wind speeds, Malta's very own Tiger Moth, resplendent in its RAF Markings, has just been restored to flying condition. The much improved conditions on Sunday meant that she was able to majestically take to the skies, under the control of Clive Denny, who five years ago had been a massive influence in the "Merlins over Malta" project. It was a proud moment for those who had helped in getting this aircraft back in the air once more. RAF flying participation came in the form of the very colourful RAF Hawk performing its Role Demo, and the Tucano, wearing its equally impressive colour scheme, impressed the crowds under the control of Flt Lt Tom Bould from 72(R) Squadron based at RAF Linton on Ouse. The Brits were there in other ways - Andy Pawsey, well known to many on UKAR, did the commentary along with several others from the UK helping with the Flying Display Direction and the Flying Control Committee. 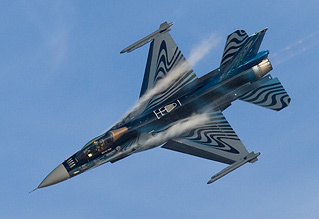 This and last year's display F-16s from the Belgian Air Force took to the skies on alternate days, expertly flown by Michel "Mitch" Beulen. The added dimension of smoke winders and popping flares in the gin clear sky was quite simply stunning against its blue hue. Not to be outdone by the Belgians, Dutch Demo Team pilot Captain Tobias "Hitec" Schutte impressively flew the now-familiar "Orange Lion" F-16 on Saturday, whilst he used the reserve standard grey spare jet on the Sunday. Both the Dutch and the Belgians should be congratulated on their most beautiful and photogenic paint schemes this year and the use of flares throughout their shows was most definitely a highlight for me! My thanks must go to the Malta Aviation Society members who organised this show. Without the help of the Armed Forces of Malta and Malta International Airport this event would not happen. This is the first time I have been back since 2005, and the welcome is still as warm as the weather. Large crowds gathered both inside and outside the airport, but with an entry fee of just 10 Euros, it remains good value for money. This is a great show for any aviation enthusiast to finish his or her airshow season off, and for those who do not get to see the sun as much as you would like, I suggest you go to Malta for during airshow weekend in September. I flew direct with Ryanair from Edinburgh, and there are plenty of hotels to choose from. So why not earn some "Wife Miles" and take the missus on holiday to the sun, then you too can enjoy the Malta International Airshow! Ciao, and see you in 2011!